Spray Nozzle Engineering has developed a new range of carcass chilling nozzles to suit existing or new system; bolted or clamped versions with your choice of nozzle requirement; full cone, hollow cone and flat spray options. Nozzle types are dependent on your application, whether static or mobile. 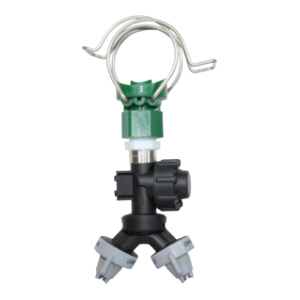 Unique to Spray Nozzle Engineering, Spray Chilling system is the Wilger Comb-Jet nozzle body and diaphragm check valve system. The complete assembly allows both installers and maintenance fitters to always have nozzles in the correct orientation. The improved Wilger check valve delivers consistent shut off and opening pressure without the problem of dripping. Contact Spray Nozzle Engineering today for free advice on total spraying solutions for your food processing needs.